Every summer has one of those perfect days. Usually food and loved ones are involved. This is our perfect summer day. The Daddi was home by 8:00 a.m. Usually he gets home by 9:00 p.m. which means we got him for one whole extra day! We decided to go strawberry picking one last time–just for fun. Growing up in the mid-west, we always drank ice tea with our meals in the summer. We made sun tea, and sweet tea, mint infused tea, and regular old ice tea. Summer is iced tea, so I decided to make some. Recently, I was in a Mexican grocery store, and came across these cane sugar pyramids. I wanted to make a simple syrup to sweeten the iced tea, so I used these cane sugar pyramids. I added some water to a pot,. . .
. . .then threw in the cane sugar pyramids. . .
. . .and brought the water to a simmer. 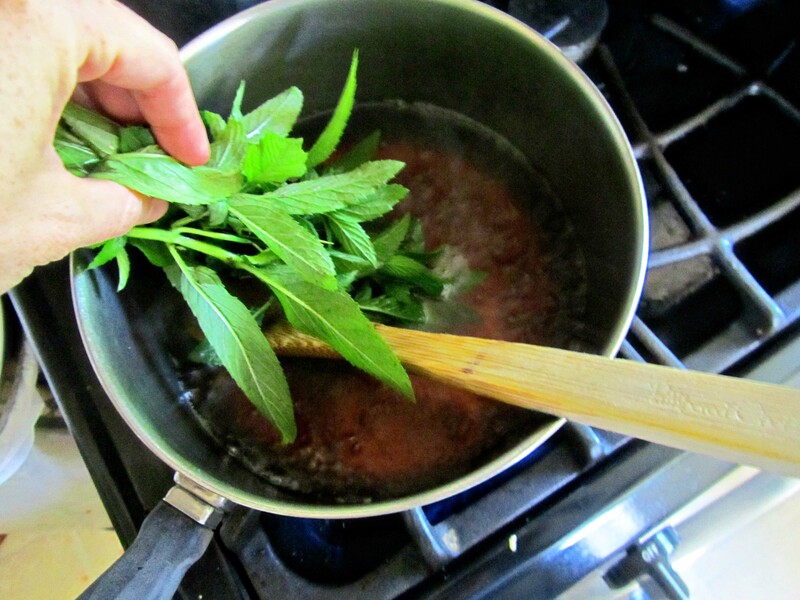 Once all the sugar had dissolved and the water thickened to a runny syrup, I added some freshly picked mint leaves. 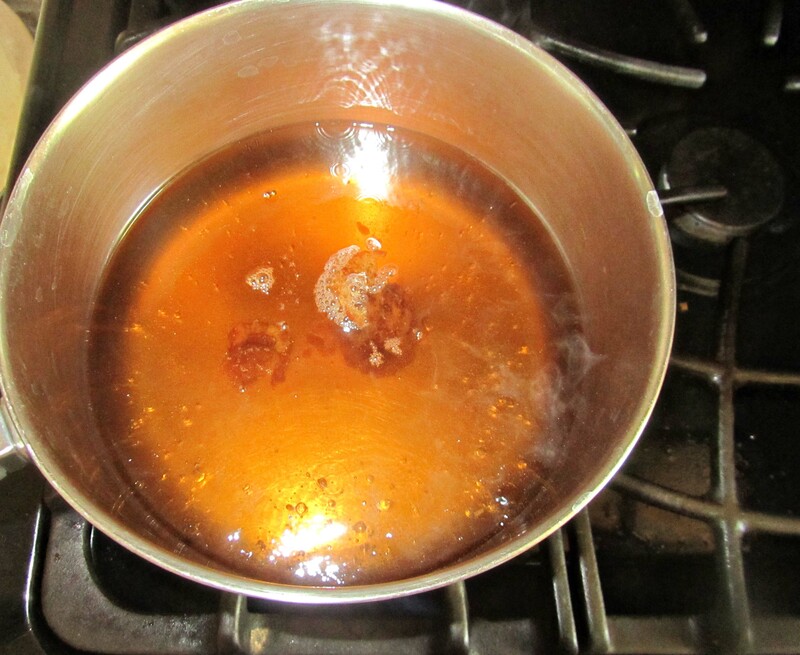 I turned off the heat, and just let the mint infuse into the syrup. Once the cane-mint syrup had cooled, I put it into a little pitcher. Everyone could add the amount of sweetening to their iced tea that they desired. Making pesto came next. 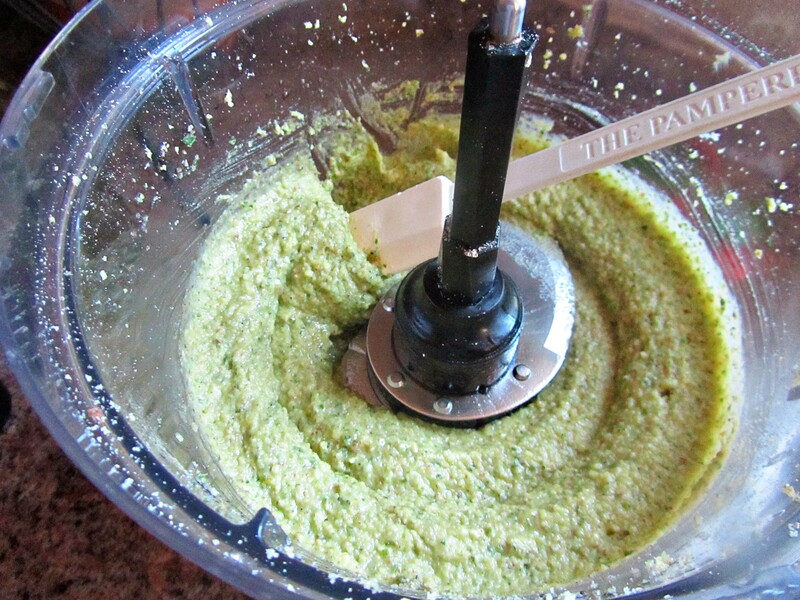 Now I used to make pesto with pine nuts. Pine nuts are delicious, but costly, so now I use walnuts. 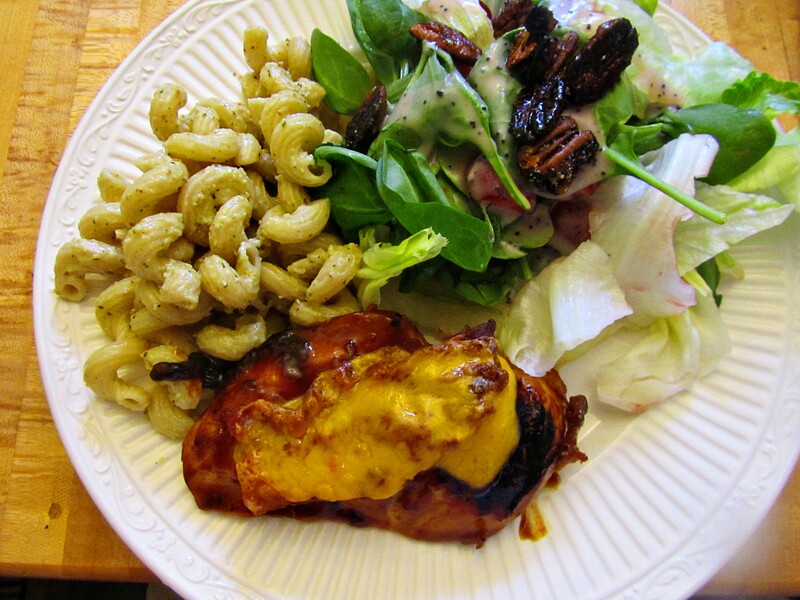 Pioneer Woman suggests pine nuts, but other than that our recipes are the same. I had basil growing just outside my window, so I snipped some leaves and washed them up. 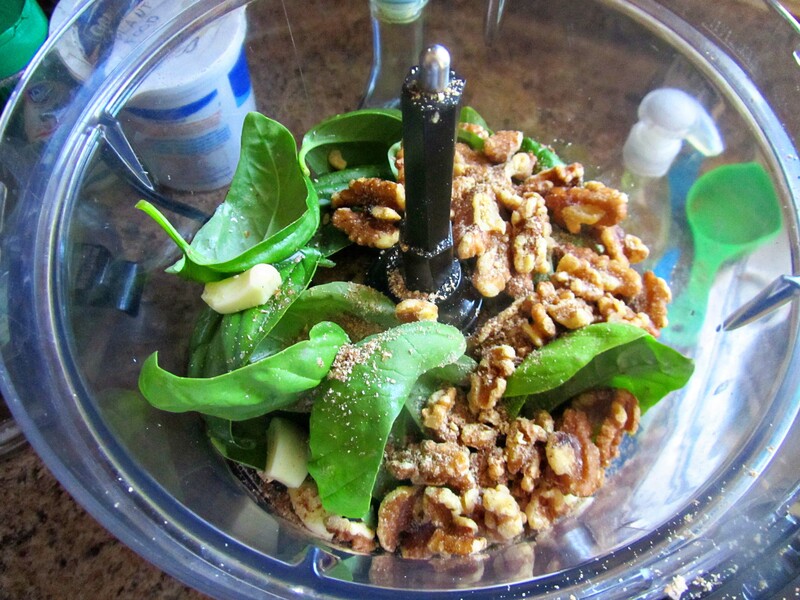 Add the basil and walnuts and garlic and salt and pepper to the food processor. Slowly drizzle in the olive oil and sniff deeply. This concoction smells wonderful. 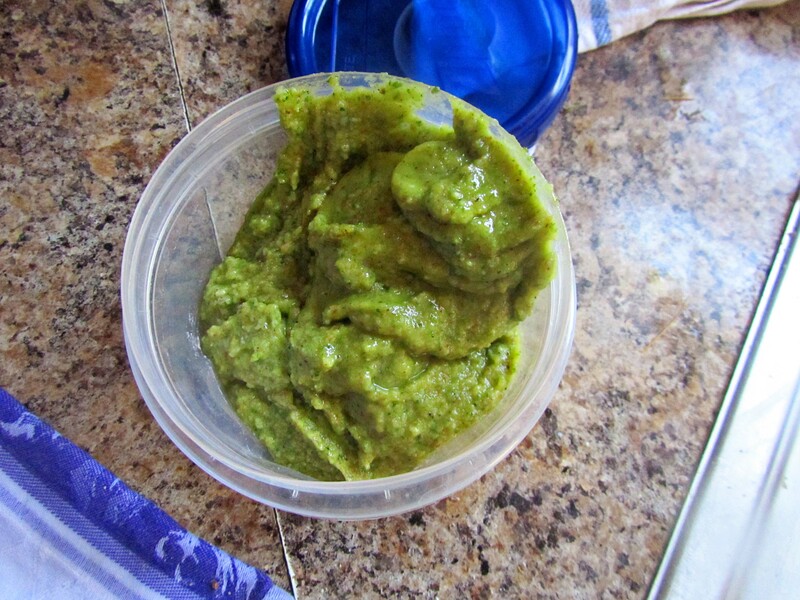 Now this is too much pesto for one recipe, but pesto sauce keeps in the refrigerator or freezer. To keep from the top layer of pesto turning brown, my Aunt Ann taught me to store the pesto sauce with a layer of olive oil poured over the top. 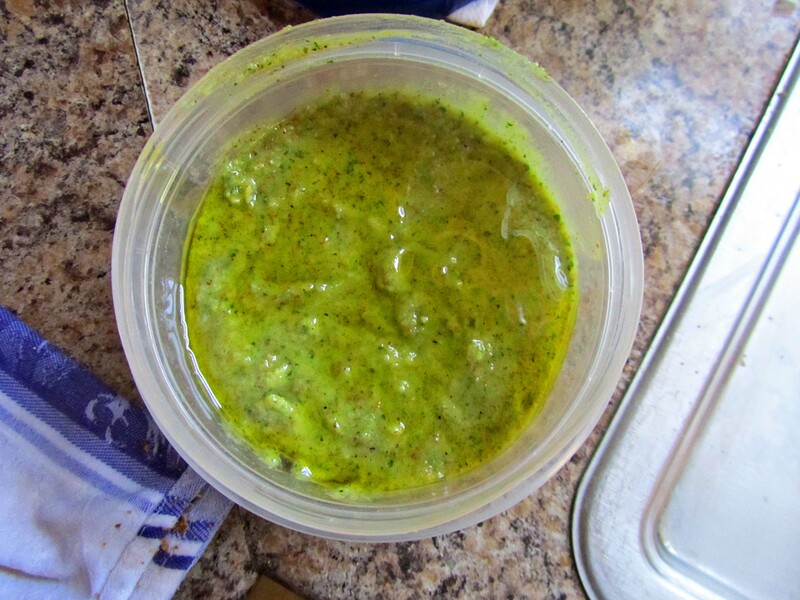 I freeze pesto in the summer for a taste of summer in the middle of those long Michigan winters, and the olive oil top coat keeps the pesto looking fresh. I sometimes have to add more oil after using the pesto. The PESTO CREAM SAUCE is finished by melting butter in a sauce pan and adding in heavy cream, pesto sauce, and more Parmesan cheese. Pioneer Woman added freshly diced tomatoes to her PASTA WITH PESTO CREAM SAUCE, but I opted to leave them out. 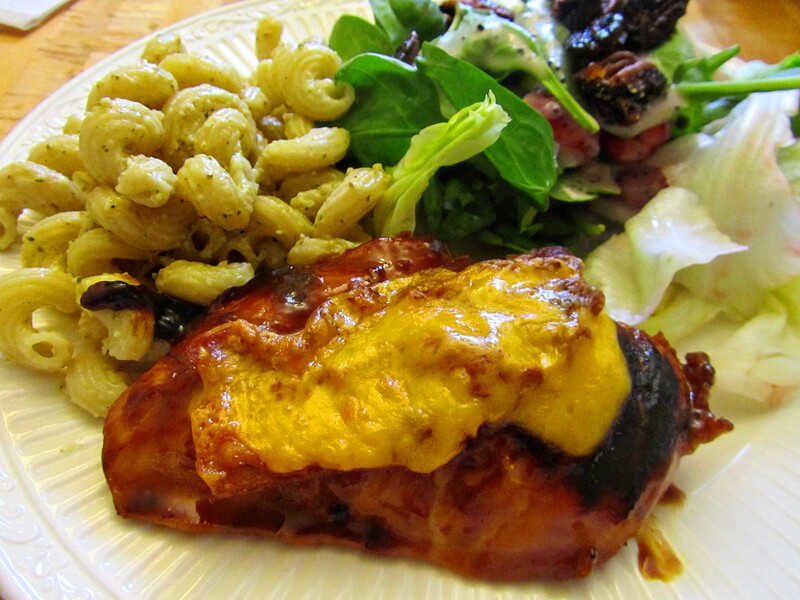 The RANCH-STYLE CHICKEN needs to marinate, so start early. 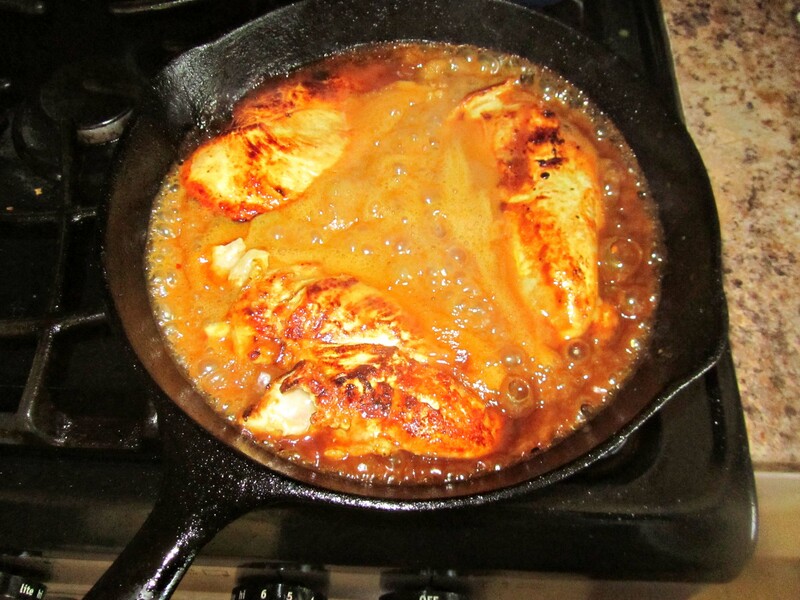 Ree Drummond grilled her chicken, but I was happy working in the kitchen, so I just cooked the chicken in the marinade. 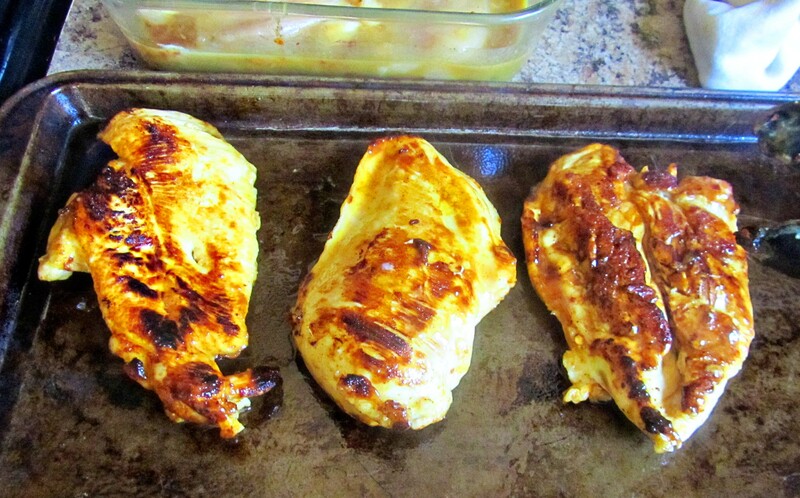 Then I placed the cooked chicken in a warm oven while I finished cooking the rest of the chicken. 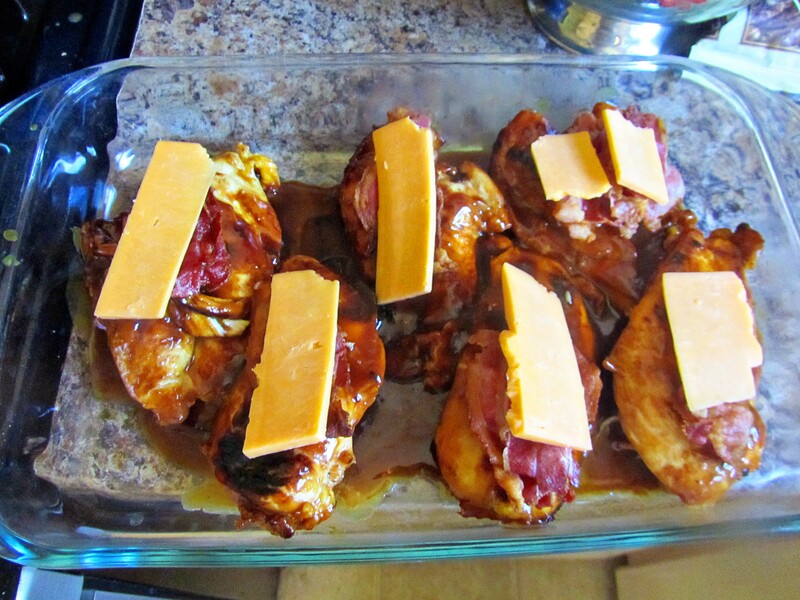 Once all the chicken was finished, I added the bacon and slice of cheddar cheese and put everything back into the oven to melt the cheese and stay warm. With this meal, I wanated to use the strawberries that we had picked that morning. 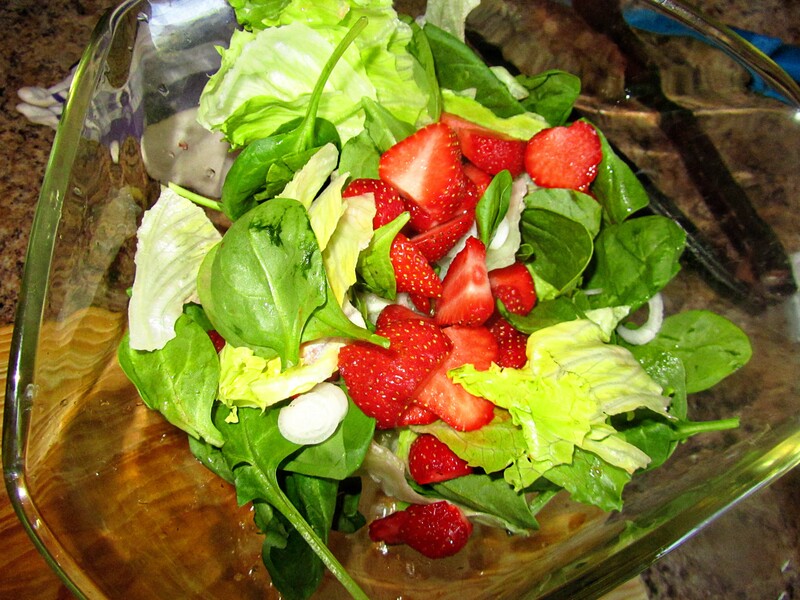 I love a Strawberry Spinach Salad with Poppy Seed Dressing–only I used mixed greens instead of just strawberries. 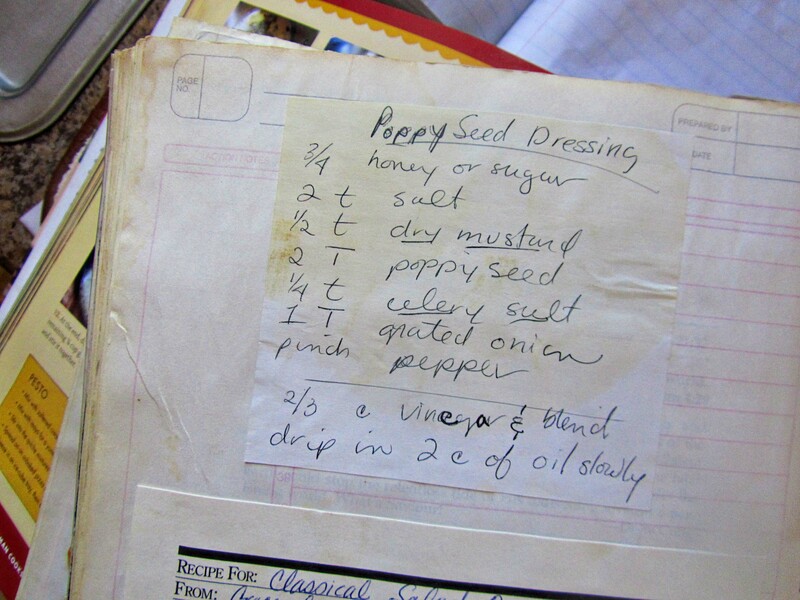 My favorite Poppy Seed Dressing comes from my friend Rene. Here is her recipe with my changes. 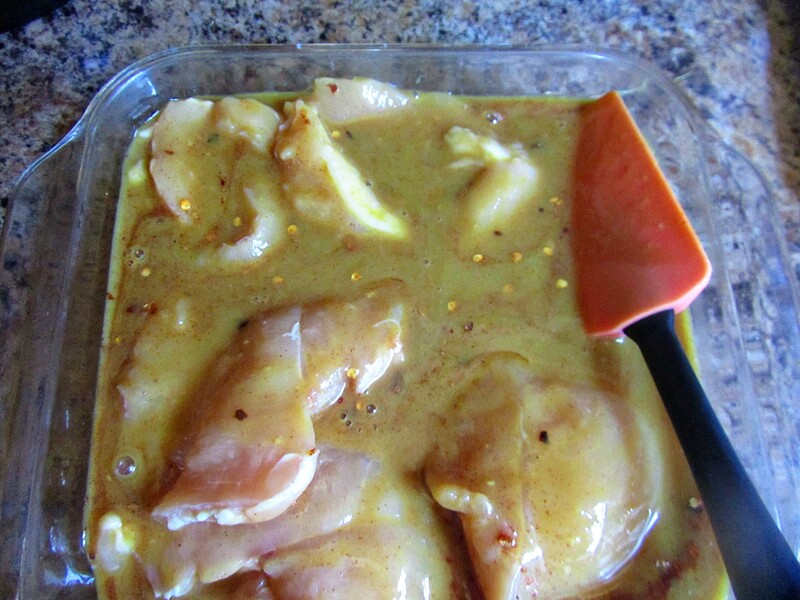 Add 3/4 cup honey, 2 t. salt, 1/2 t. dry mustard, 1/4 t. celery salt, 1/4 t. pepper, 2/3 c. apple cider vinegar. 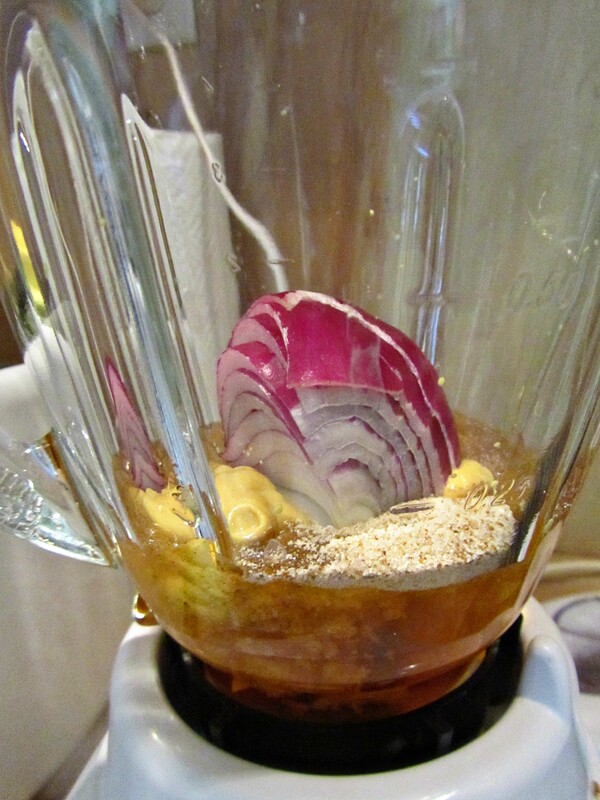 (You will also need 2 T. poppy seeds, 2 c. oil, and 1/4 of a red onion, but that comes later.) Do not add the poppy seeds at this point. This is about the only recipe I have that uses celery salt. I tried omitting it, but it tasted flat. I tried adding chopped celery to the blender, but it just make a stringy flat mess. So I don’t think you can’t substitute the celery salt. You can, however, use prepared mustard. Do not add the poppy seeds at this point. I add about 1/4 of a red onion. 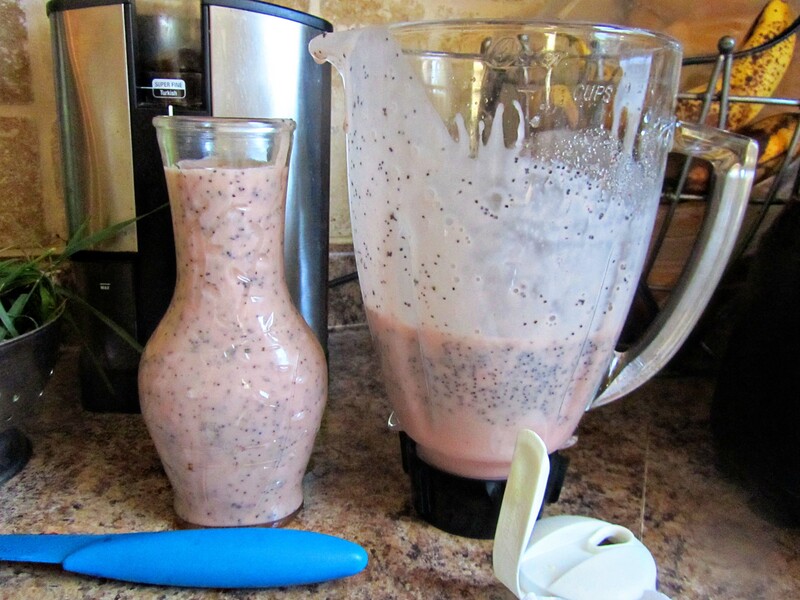 This gives the Poppy Seed Dressing a gorgeous pink hue, that looks great on a Strawberry Spinach Salad. Do not add the poppy seeds at this point. Whirl all the ingredients together, then slowly drizzle in the 2 cups of oil. 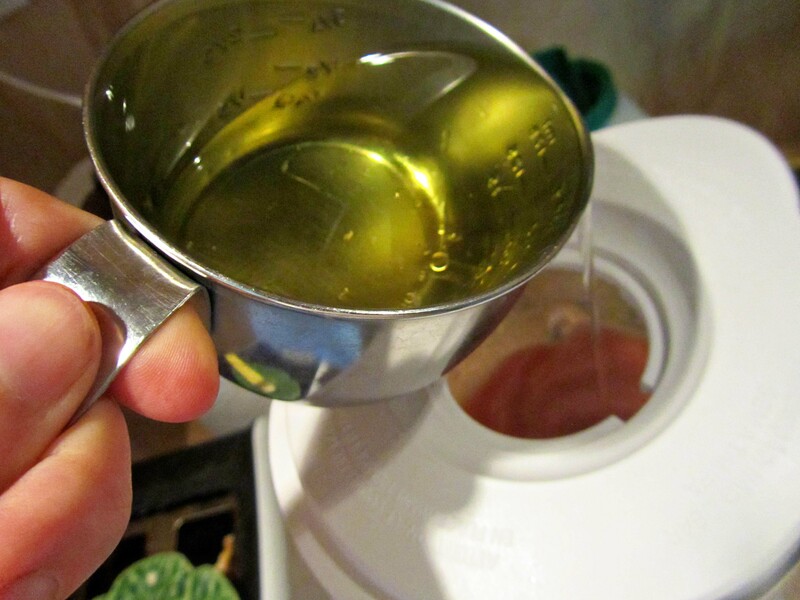 I like olive oil, but I have also used Canola Oil. This creates a lovely, light, pink, emulsion. Please do not add the poppy seeds at this point. NOW, you can add the poppy seeds. I have made the mistake of adding the poppy seeds then turning on the blender. 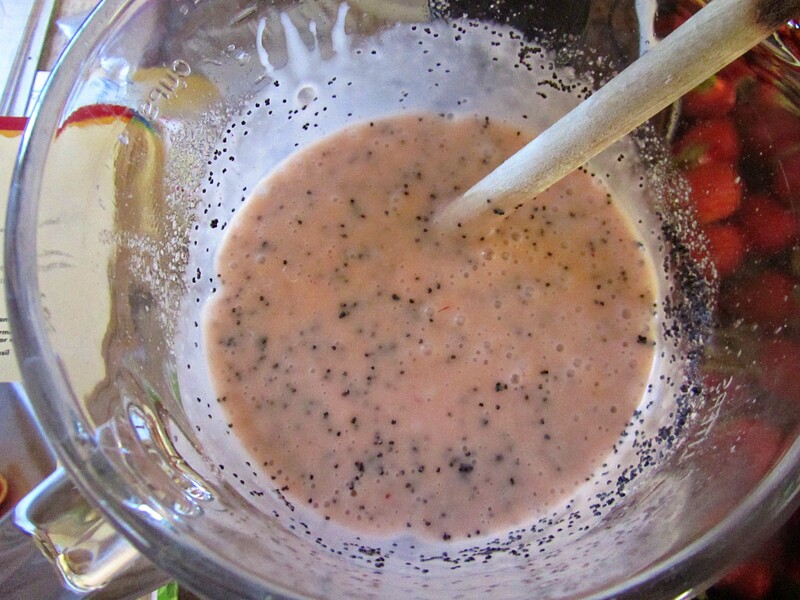 The result is little black flecks of purred poppy seeds that detract from the salad dressing. You can now add the poppy seeds, but just stir them in. 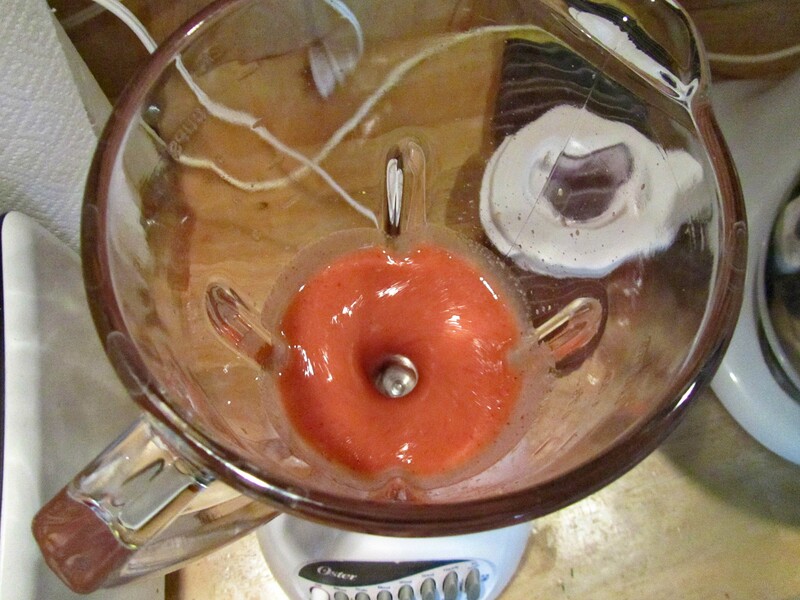 Don’t turn on the blender to mix them. This recipe makes a lot of dressing. You can halve it if you wish, but it keeps forever in the refrigerator, and we go through it rather quickly in this household. The final touch to the Spinach Strawberry Salad is the caramelized pecans. 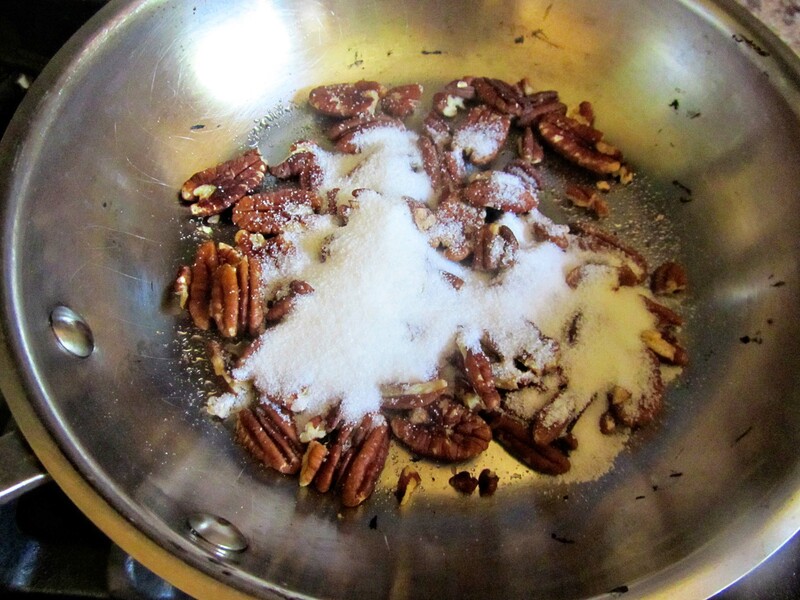 I never measure, but just add some pecans and dump in some wonderfully-refined-tastes-divine white sugar. 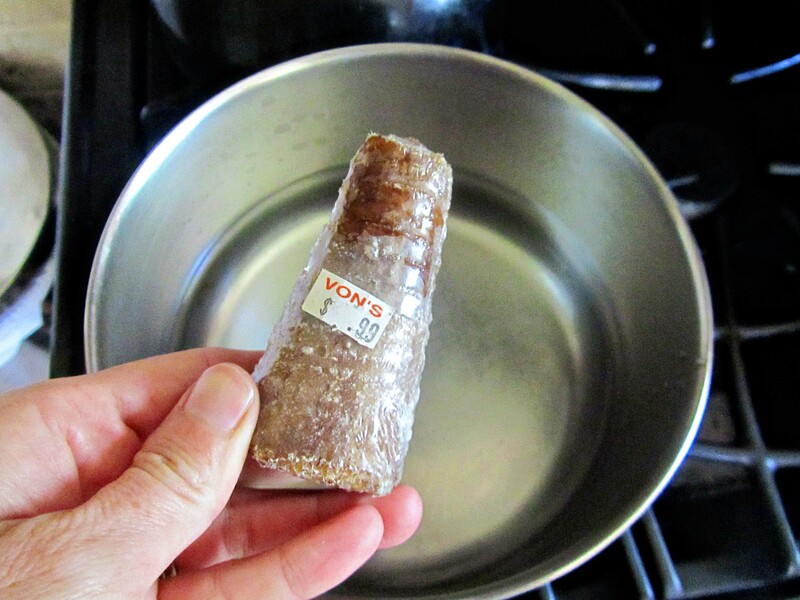 Keep the heat on the low side, and just let the sugar melt and coat the nuts. Dump the nuts on a cutting board to cool, as the sugar hardens and makes them stick to the pan if they are left in there. 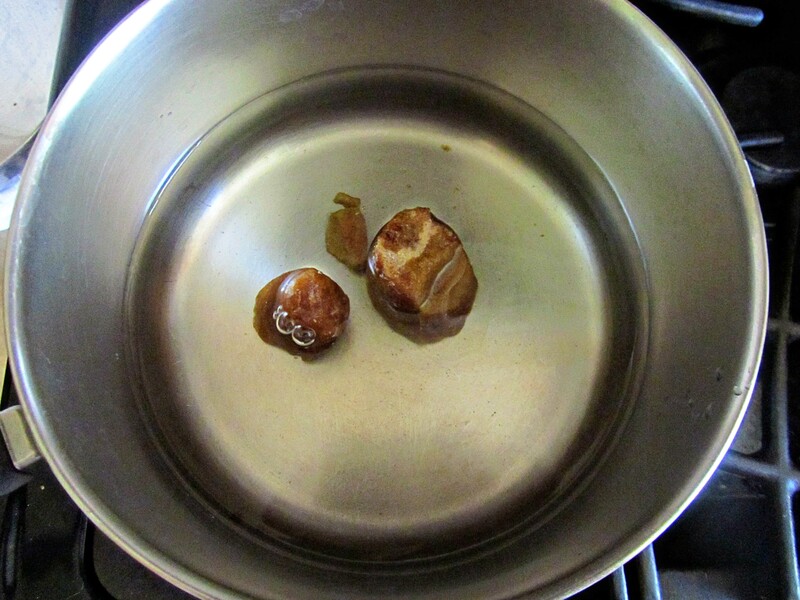 Once the carmelized nuts are cooled, roughly chop them, or just break them apart. 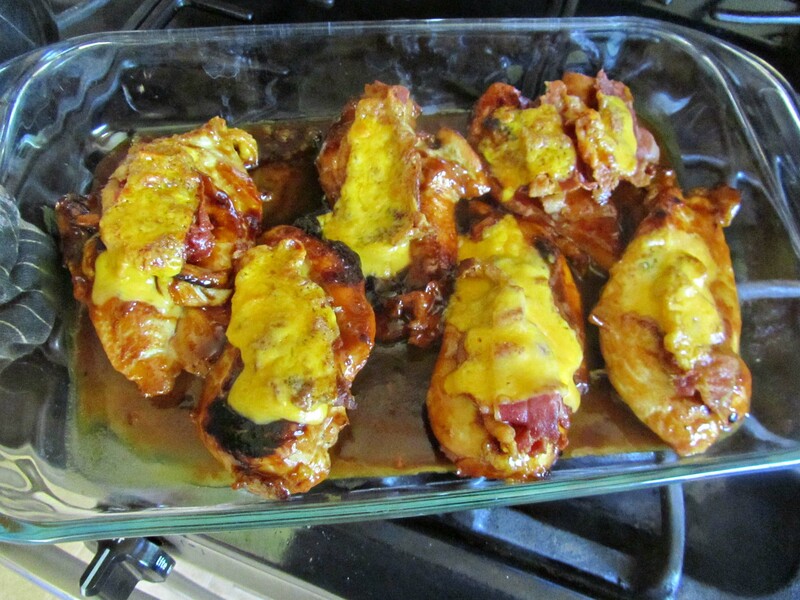 The RANCH-STYLE CHICKEN is finished. The pasta is cooked and tossed with PESTO CREAM SAUCE. The Strawberry Summer Salad is finished, now just ring the dinner bell. 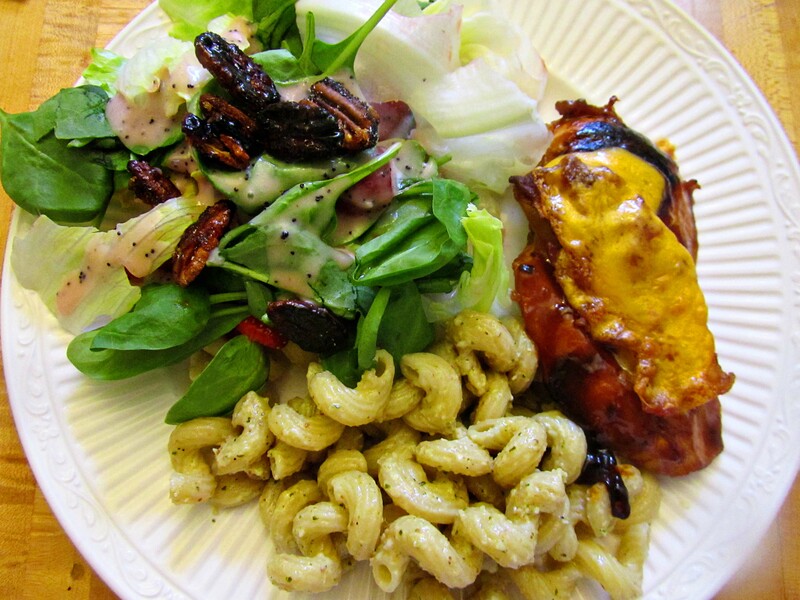 A perfect meal–Ranch Style Chicken, Pasta with fresh Pesto Cream Sauce, Strawberry Summer Salad, and Iced Tea sweetened with Mint Infused Cane Syrup. I wish it were June 12 all over again. I wish it were June 12 all over again AND that I was at your house! Susan said it first, and I agree. And do you remember the pesto we found in your aunt Ann’s fridge at the cabin? 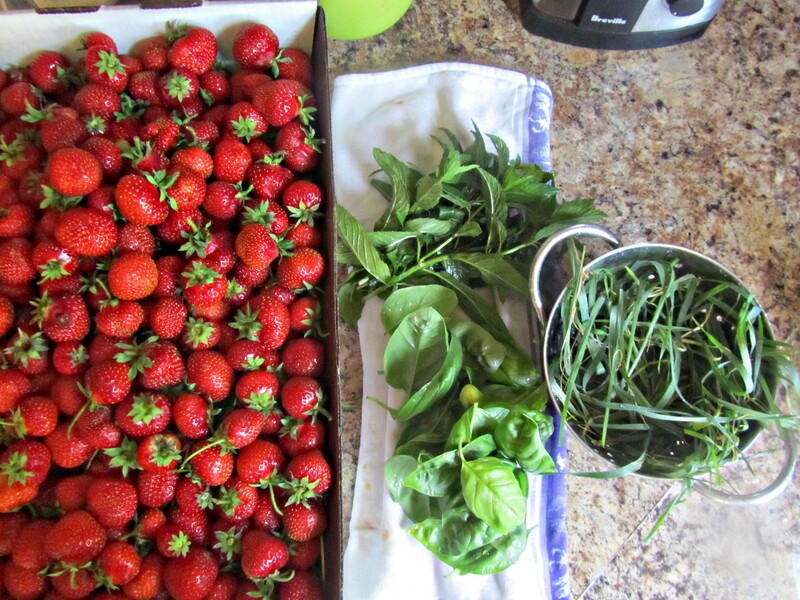 Still good, and I’ve never forgotten the trick since then, though I hardly ever get enough basil to make pesto. Think I could sub pecans? M’s allergic to walnuts, and I’m allergic to the cost of pine nuts. Yum! But, at 11:01 p.m. I am safe for now. 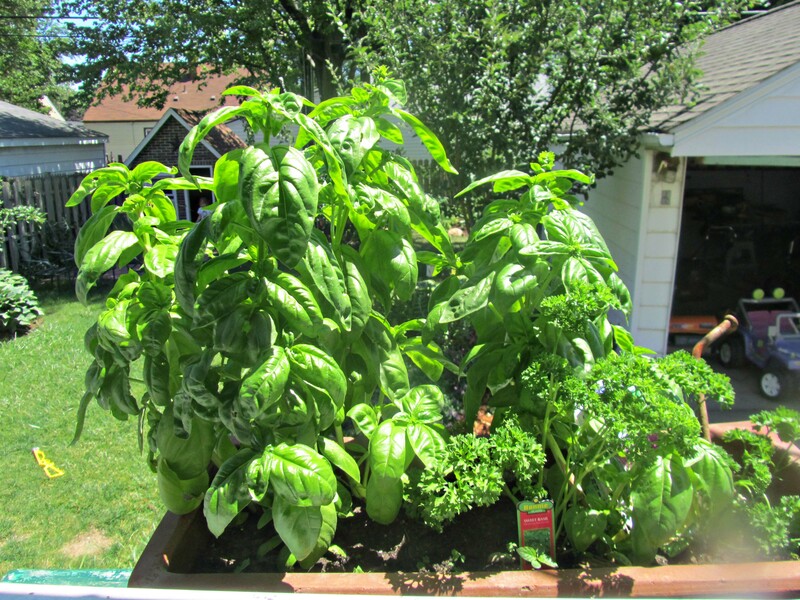 Your basil looks amazing! I have basil growing issues. Mine always gets stubby and gnarled looking. I pinch it back to keep it from flowering and to encourage new growth, but it still gets it’s same old problem. Grrrr.